I received the stethoscope today. Thanks for the excellent service and speedy delivery of the product My sister really liked the stethoscope. Plus the engraving gave a personal touch! 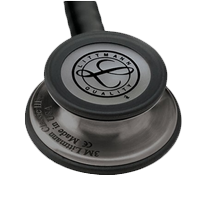 Excellent stethoscope, fast shipping and got the best price. Very happy with my experience. The diaphragm lid of littmann classic 3 is too loose that it detached many times .. Very good.excellent coordination in this team....I had an urgent requirement.the staff did thier work so fast and kept their promise by delivering the item 1day before itself..keep it up. SMB is very punctual in its service. I ordered Littmann Class III Seth, and they sent the order even before the expected date. Absolutely satisfied with the service. Thank You very much. I love the colour. Its not a proper lavender , its more to the purple side and i love it . Genuine product. Love it!! Beautiful Littmann aesthetics! Performance undoubtedly superior compared to rest of the brands, but there's something extremely special about owning this chocolate-copper model. Yaa!! Got the same which I actually found. Thanks SMB. The customer care support is just brilliant with you people. Timely response and solution is fascinating . Keep it up. Great addition to my journey to becoming a doctor! Absolutely love the colour and quality. The free engraving is a beautiful bonus.